This cartoon is the Reader's Digest "Beat the Cartoonist" drawing for August. The idea is that readers submit their captions, and the three best ones are posted on the website alongside my original wording. There's no clue as to which is the original, of course. 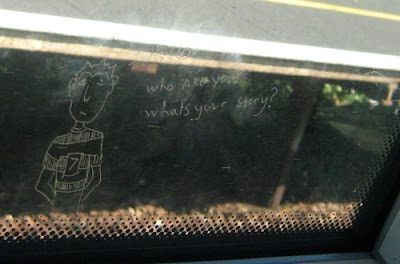 Visitors to the site then choose their favourite and if a reader's caption gets the most votes, that reader wins a cash prize and the original drawing. I'll try not to sink into a deep depression if readers pick someone else's caption. 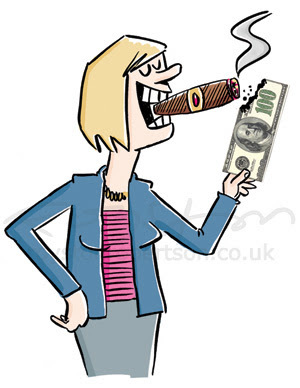 As compensation for the hurt caused to us sensitive artists, we get paid extra for the original artwork anyway. They certainly picked one with a lot of drawing in it. This took me ages. And I wasn't very happy with it, so I put in on the lightbox and drew it again. Which means that the artwork that someone may win is remarkably Tipp-Ex free ... a desirable item indeed! Getting the right size and shape for gag cartoons can be tricky and can require experimentation. Increasingly, I find I'm drawing them in a portrait shape, but with some jokes you have to go landscape. This cartoon (click to enlarge) appears in this week's Private Eye. 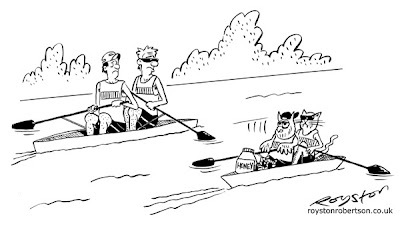 Originally the Owl and the Pussycat were rowing with no supplies. After the magazine took the gag, they contacted me to say that the characters were not easy to make out at the size the cartoon would be printed, and they suggested the honey pot to make it more clear. Works OK, I think. In fact, I wasn't really thinking magazines when I drew this. It was originally drawn on-spec for an exhibition of rowing cartoons that a cartoonist colleague is hoping to stage next year, which is probably why I went for the "wider canvas". I'll let you know the details of the exhibition if and when that goes ahead. "C'mon you guys, I just need my own space sometimes." 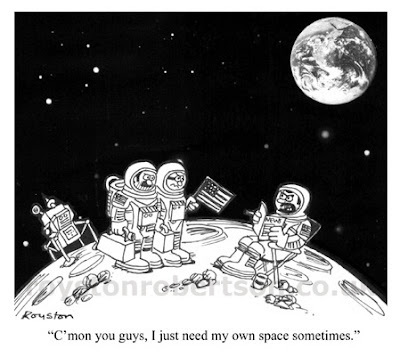 This cartoon is so old that it was only 20-odd years since the Apollo 11 Moon Landing when I drew it. The joke is probably even older. Occasionally I put down my pens, get on a train to London and socialise with other cartoonists. And a right good laugh we invariably have as well. 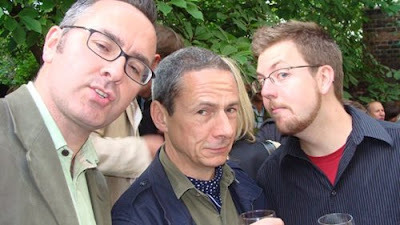 Here's me pictured last week at Prospect magazine's annual summer party, with fellow scribblers Paul Lowe and new boy Rob Murray. I think my dazed expression is the result of the flash from the camera wielded by another cartoonist, Clive Goddard, and not, as you may think, the effect of too much free wine. 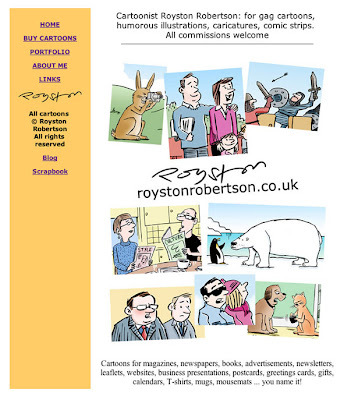 Of course, being invited to a magazine's party is no guarantee that your cartoons will appear regularly in it, and in fact I've not been seen in those pages since February. But they're very nice people who give booze and canapés to cartoonists, so I'll let them off. 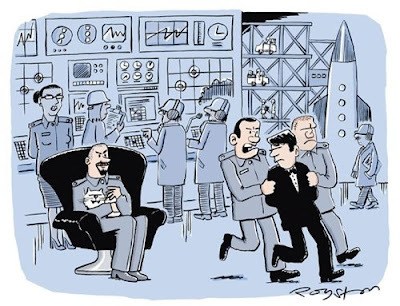 Here's the first cartoon of mine that Prospect published, from way back in October 2004. "Yes, it's a senseless act, but I fail to see how it has 'all the hallmarks of al-Qaida'." Here's an excerpt from a cartoon I drew recently for a business magazine. It was a last-minute decision to use a real image of a banknote and I think it, er, paid off as it works quite well. It was for an international magazine, hence the use of a "Benjamin" rather than a British banknote. This kind of thing is quick and easy to do these days, thanks to Google Images and Photoshop. I had to tamper with the banknote a bit, making the "100" bigger and clearer. I hope this doesn't mean I'm going to jail? 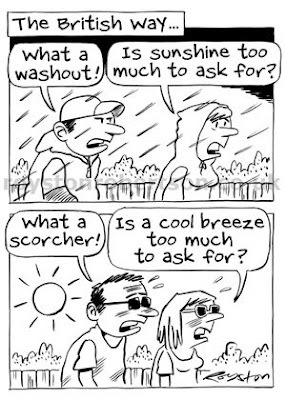 The trouble with weather cartoons is that as soon as they reach publication the weather changes. Looks like we're back to panel one now. 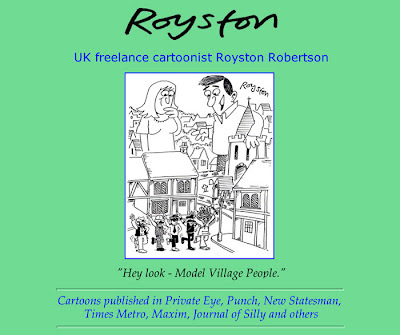 Last month marked ten years since I first "launched" (rather a grand word, as nobody noticed) my cartoon portfolio website. I know this as I've still got the HTML pages on my computer. Here's what it looked like in 1999. Click to enlarge. Hey, internet retro! Man, we loved those line rules back then. I put this together using a very basic grasp of HTML gleaned from a two-sheet A4 handout used by a friend of a friend who used to teach computers. What's amazing is how many sites you see now that still look like this. 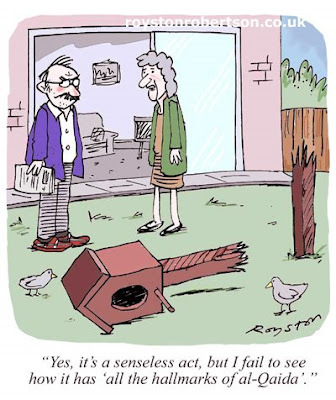 The main cartoon was from New Statesman, from the days when they took on-spec gags. Scrolling down (it was only one page at this stage) we see a selection of gags from the Times' Saturday section Metro, now no longer with us. Excuse the redacted old phone number! In the top left you can see the original of the leopard cartoon that has served me well and which I wrote about in May: Cartoons that keep on going. 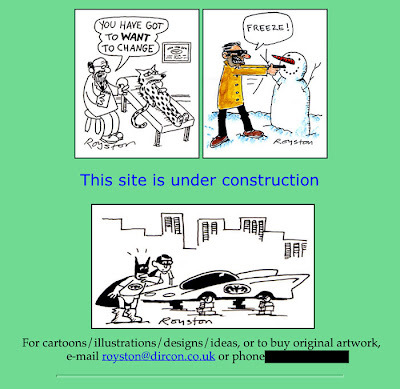 My knowledge of HTML is still pretty basic so my portfolio site (which you can find at roystonrobertson.co.uk) may be slightly slicker and more well-stocked with (better) cartoons, but it is still a pretty straightforward affair. But when you're simply presenting cartoons, with a bit of info about them, I don't think you need too many whistles and bells.